Yes, this is a cheap marketing stunt. But it's one I want to own. Or at least borrow for the weekend. 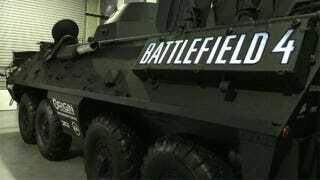 EA's Australian outpost and Origin - the PC manufacturers, not the EA online store - have built the "Battlefield 4 and Origin PC Armoured Division Tank", a clumsy name for what's essentially a converted Armoured Personnel Carrier full of gaming PCs. Pop open the rear hatch and you'll find six computers in neat slide-out housings. Seating doesn't look terribly comfortable, but then, there should be little comforting about cramming six humans into the back of a military vehicle to play video games. It'll be touring Australia in 2014 as a glorified Battlefield 4 demo unit. Let's hope it's also available for hire at weddings.